If you want to make a backup copy of your favorite videos or movies for permanent preservation, then burning video files to a playable DVD would be an excellent option. Below will instruct you on how to burn videos to DVD in details. First of all, you need to download and install Wondershare DVD Creator on your computer. And then simply follow the steps to burn your DVD. 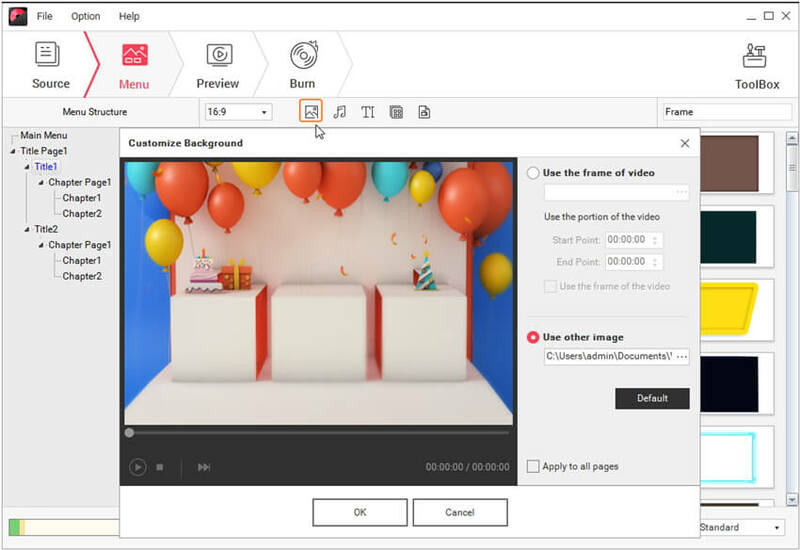 Launch Wondershare DVD Creator and choose disc type as the on-screen instruction requires. Here takes Create a DVD Video Disc for example. Then the program will display the loaded video thumbnails in the left together with the video name and length. If you want to create new Title page, just hit in the bottom-left side. Similarly, clicking enables you to add videos to the Title. Move the mouse over the video thumbnail, there'll be a pencil-like icon just as the screenshot shows. 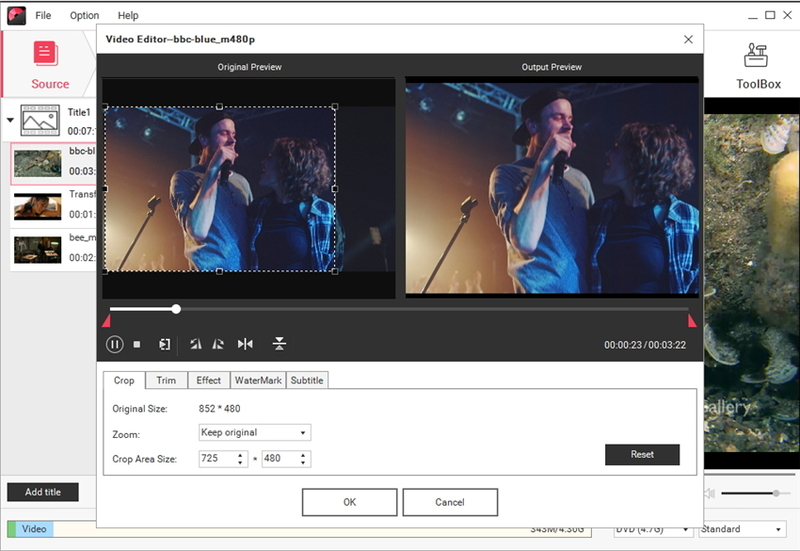 Click and you'll get the Video Edit window, where you can crop/enhance/trim video, add effect, watermark and subtitle as you wish. Visit Video Editor to learn how to edit video in detail. If you want to change the video order, just select the video and click or . Alternatively, you can also right-click the video and choose Move up or Move down to adjust the sequence. 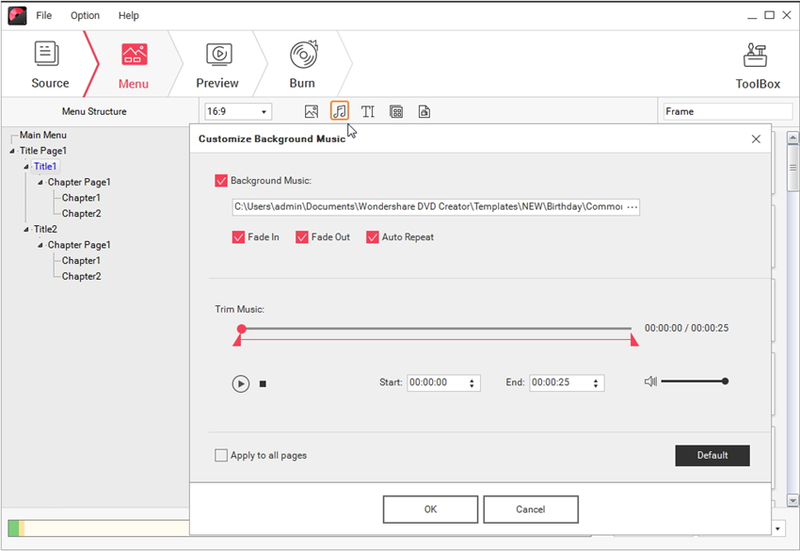 Click the Menu tab in the top, you can see the clear Menu Structure in the left and over 100 free DVD Templates in the right. 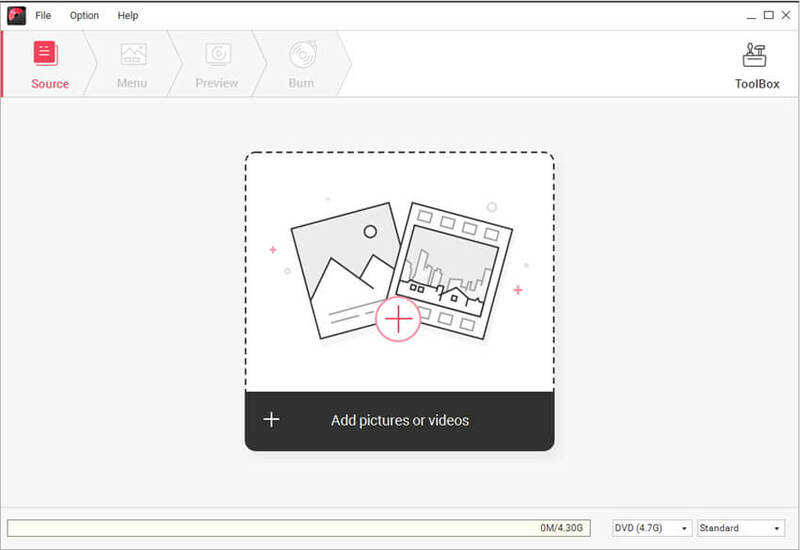 Double-click the template thumbnail would change the default one to your liking. Click to choose your favorite menu themes from sport, travel to family. Wondershare DVD Creator provides you over 100 DVD menu templates for better user experience. 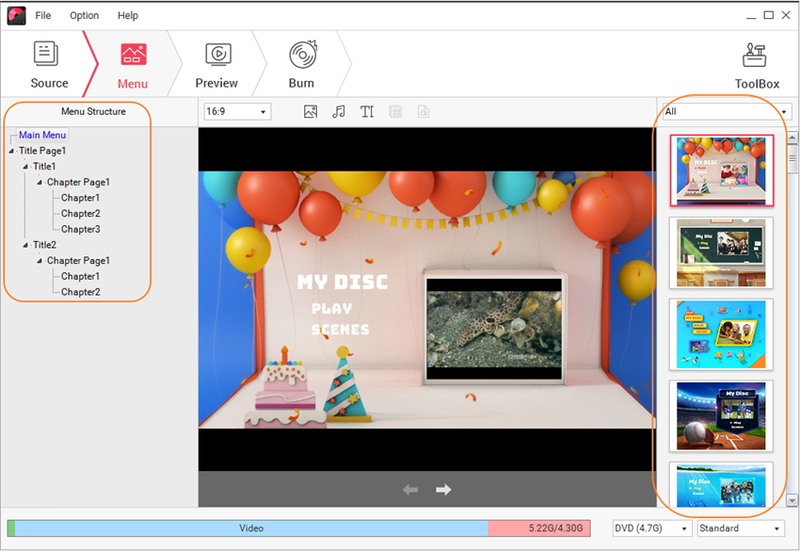 Apart from the DVD templates, there're another 6 tricks that help to customize your DVD. Click to change the chapter frame. Click to customize the background image. Click to add or edit background music. Note that Wondershare DVD Creator not only trims music but provides 3 sound effects to enhance the background music. Click to add text to the main menu for necessary notes. Select the textbox and you'll be able to set the font size, color, etc. Click to replace the chapter thumbnail with other images. Click to create chapters. 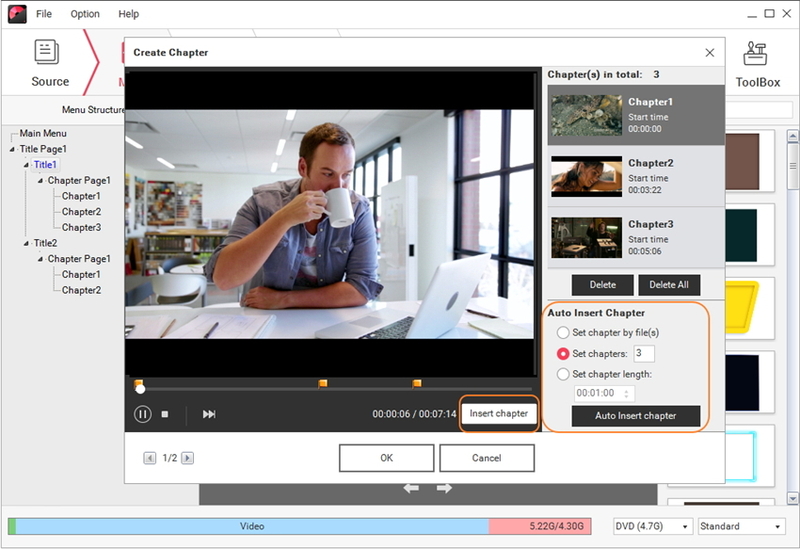 You can either manually insert chapter or set auto insert chapter based on your needs. 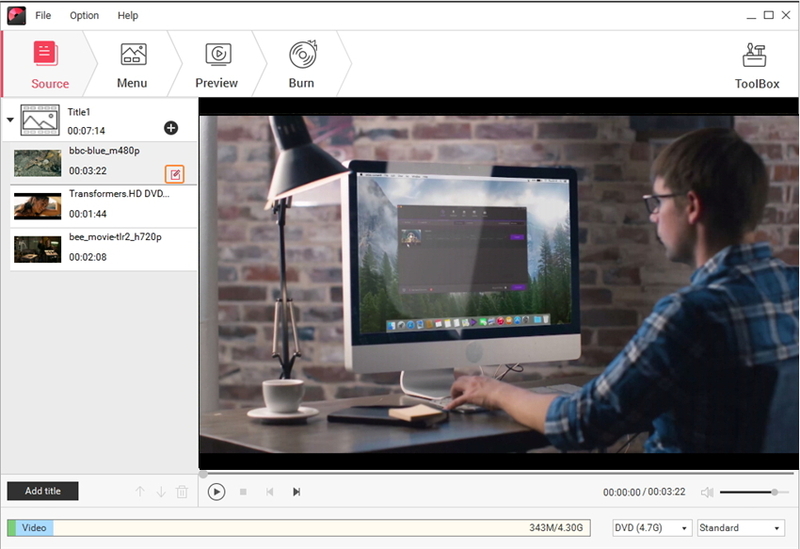 When finished, switch to Preview tab to view your DVD creation. You can always go back to Source or Menu tab to make adjustments if you're not that satisfied. Once you're satisfied with the DVD preview, proceed to the Burn tab and preset DVD settings as requested. After that, hit Burn to start burning video file to DVD right away. If you have DVD disc at hand, insert it to the computer and choose Burn to disc. Otherwise choose Save as ISO. 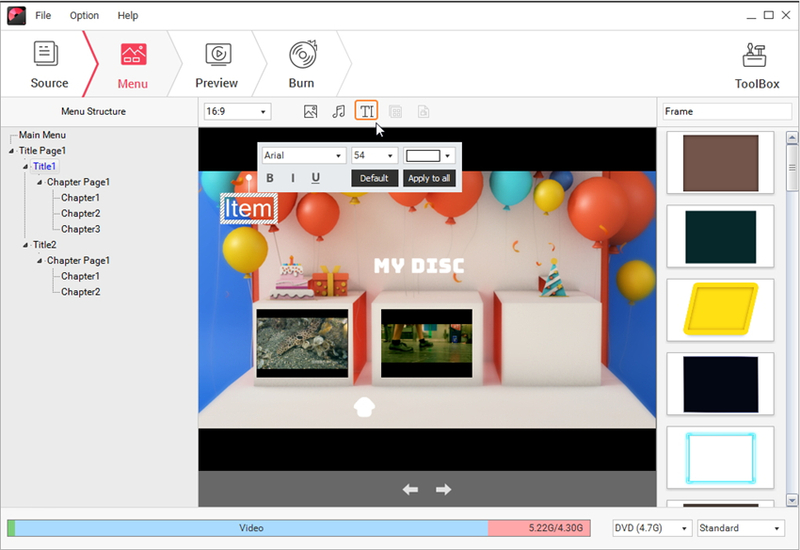 Aside from converting any video files to DVD, Wondershare DVD Creator also functions as Blu-ray DVD burner that easily transfers video to Blu-ray disc. All you need is to return to Step 1, choose Create a Blu-ray(BDMV) Disc and follow the instructions mentioned in Part 1. 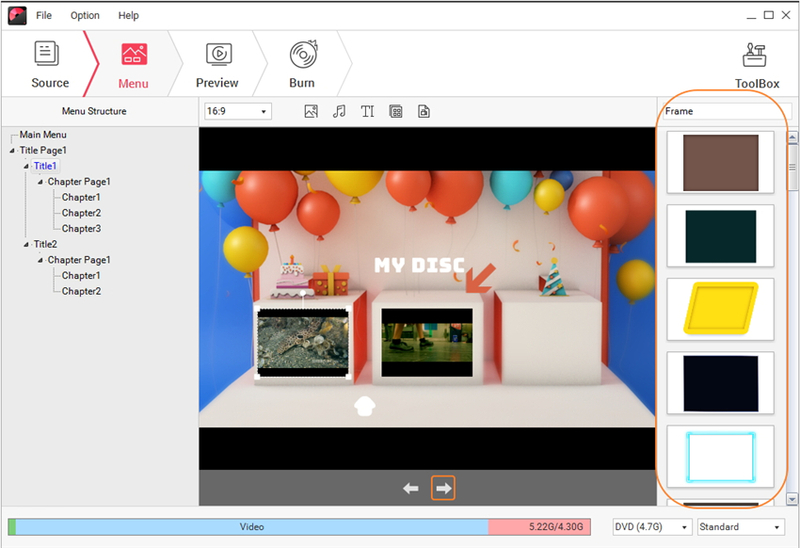 Select Create a DVD Video Disc if you want to burn videos to DVD disc. Choose Create a Blu-ray(BDMV) Disc if you want to transfer videos to Blu-ray disc. Hit Data Disc if you want to burn videos, audios, and images to data disc. Opt for One-click to Burn DVD if you want to burn DVD without menu or template settings. 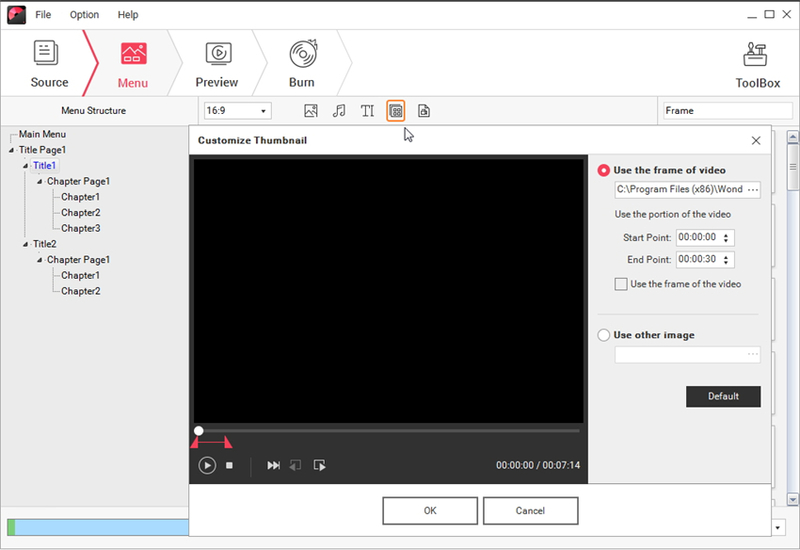 Click More DVD Tools if you want to access the built-in toolbox.